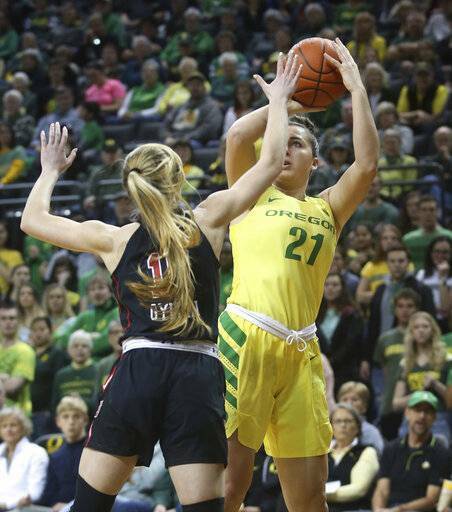 The Oregon women’s team is playing more and more like they’re ready for a title run. They were a number-one seed as of the January 28th Bracketology. Now at 21-1, they did nothing to change that last weekend. Along with their great talent, the Ducks play team defense, share the ball, everyone rebounds, and they do all the little things. Someone makes the extra pass. Someone sets a great screen. Ruth Hebard or someone else reacts early to help on D. They play unselfishly for each other. The Ducks also force teams to defend all of their great outside shooters. They do it by moving the ball quickly, or dumping it to their post players, then sliding to open shooting spots. As the nation’s leading scoring team, their offense gets a lot of press, but on Sunday, Oregon held the Colorado Buffaloes to two points in the first quarter. That’s incredible defense. Sabally is averaging almost 18 pts and isn’t even the focus of Oregon’s offense. 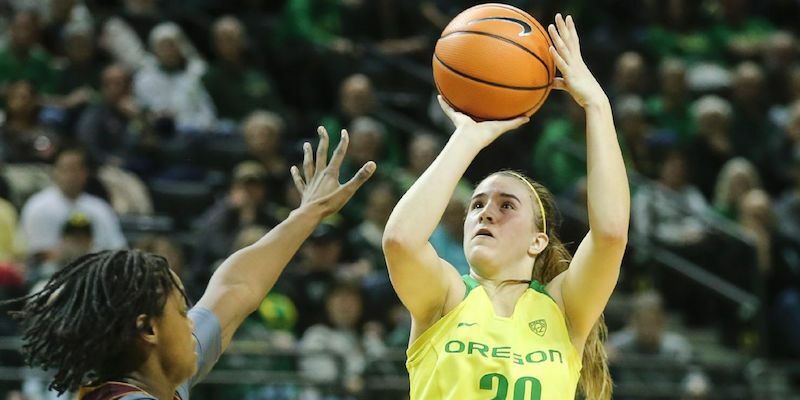 In the second half of Friday’s win over then 14th-ranked Utah, Oregon had five players in double figures, and their best player Sabrina Ionescu wasn’t one of them. Ionescu scored late in the game to finish with 11. Hebard, Ionescu and senior guard Maite Cazorla figured to be the keys to this season, but it’s the incredible growth of two other players that is separating Oregon from all but a few teams in the nation. 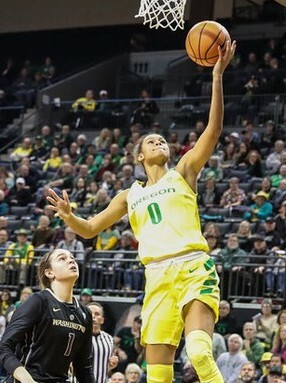 The keys to Oregon making a title run are Erin Boley, who transferred from Notre Dame, and emerging sophomore Satou Sabally. Boley’s deep shooting ability stretches the floor and opens up the lane for Ionescu drives, or for Hebard or Sabally to post up. Boley was the Gatorade National Player of the Year in high school. At Oregon she’s the fourth or fifth offensive option. That’s how deep the Ducks are. Sabally is looking like she’ll be an All-American soon. She can post up, hit the three, defend three positions, pass from the post, or play the pick and roll with the ball in her hands or as the screener. Oh, and she’s a great rebounder, too. Sabally’s game is a sure bet to be on every watch list next year. Oregon would be even deeper if it hadn’t lost all-everything recruit Nyara Sabally to a knee injury in August. She’ll return next year. Enjoy Ionescu now, fans. ESPN’s first WNBA mock draft has her as the number-one pick this year. She can leave after this, her junior season. Watch her play and you’ll know why. Who knows whether she’ll leave, but if she’s going to be the number-one pick, that will be hard to walk away from. Cazorla is listed as a third-round pick in the same mock draft. Hebard could leave early. I don’t know that she will, but she’s been on every watch list and is playing at a really high level. She made 10 of 10 shots against Colorado on Sunday. How Can the Women Win a National Title? They need to stay healthy, so they can use their depth to wear teams down and give them flexibility when they get to tougher opponents. Any Duck injury gives Coach Kelly Graves fewer ways to attack opponents. That doesn’t matter against most opponents, but it starts to when a team reaches the Sweet 16 in the NCAAs. Oregon’s depth could be a difference-maker at that point. Erin Boley’s quick release makes her tough to defend when she gets hot. The Ducks can also win every game but one until the conference tournament, and still be the number-one seed. A loss to highly ranked Stanford or Oregon State won’t push them from the top four. (They also need to win the conference tournament.) Anything over 30 wins with just two losses, and Oregon’s all but guaranteed a number-one seed. There are six great teams this year: Baylor, Oregon, Connecticut, Notre Dame, Mississippi State and Louisville. Other teams are capable of beating those teams, but Oregon State, Stanford and the rest are a level behind those six. Getting the top seed clears a path to success, because the fourth overall seed in the tournament plays the fifth. Right now, Louisville is the fifth overall seed, making them the likely two-seed in the west. If Oregon is a number-one seed, it stays out west, and that regional final is in … Portland. Yes, the Ducks would be playing at Moda Center in Portland to go to the Final Four in Tampa, Florida. A number-one seed makes their path much easier. Get your tickets now. Ordinarily I’d say getting a split in the mountains is a great thing. But the Ducks’ habit of sleeping through the first 10 minutes of every game has caught up to them. Their performance against Colorado was so ugly, I’m not sure how they recover from it. Even so, they got down by 14 against Utah and then played great and tough to dig out of it and win. Why isn’t Oregon ready offensively at the beginning of games? I don’t know. But what they’re doing wrong I can tell you right here. They come out shooting low-percentage, contested jumpers that have little chance to go in. Stop shooting deep jumpers to start every game and take the ball to the basket. 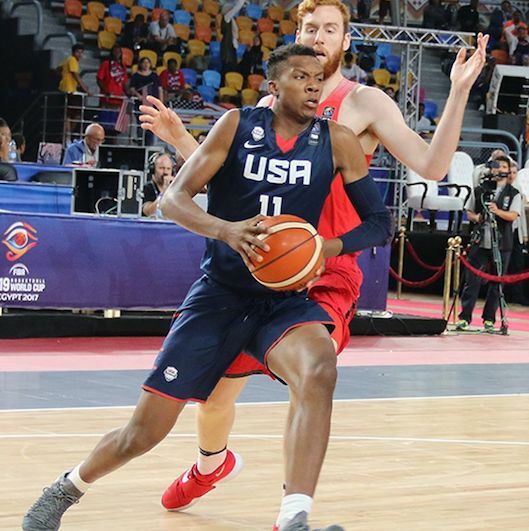 King needs to post up and drive the lane more for Oregon, just like he did for USA Basketball. This time it was Louis King who started the game this way. Then they just kept shooting bad shots. They don’t set solid screens for each other, and they haven’t developed a post game on the block to keep defenders from extending against them. There are some things Oregon could do. Put King on the block. Put Paul White on the block. Put anyone on the block who can post up to get the ball inside and back out instead of only running the weave. As I said weeks ago, coaches know strengths and now they’re extending their perimeter defenses. They’re begging someone to post up on the block and beat them. Kenny Wooten can’t; his footwork isn’t good enough yet. Francis Okoro is solid, but he rushes his shot when he goes up. That’s his youth showing in his game. White is a 6′ 9″ guy who should be a good rebounder, but he floats around the perimeter and only rebounds when the ball comes straight to him. He’s passive. I like the guy, but that’s just the truth. Oregon was getting out-rebounded 16-6 late in the first half against CU, getting hammered on the defensive glass. Effort from White could fix that. Amin plays extremely hard at both ends of the court. Nobody plays harder than Ehab Amin. But sometimes he selfishly gambles on defense and leaves his teammates to either foul or just give up a dunk. In the first half he went for three steals that led to six Colorado points and two fouls on his teammates. You may have never heard of someone being selfish on defense, but that’s how you do it. VJ Bailey had a nightmare night against Colorado. Turning it over trying to juke someone at the top of the key, getting lost on defense, and worst of all, he still hasn’t corrected his shot mechanics. Sometimes he drifts left when he goes up, so he misses shots he’s very capable of making. Late in the second half, uncontested from six feet away, Bailey hit only the backbrace. It’s his feet and his form. Because this is a bad shooting team, they need to use their athleticism to drive the lane when the game starts. Get some fouls or early buckets and then start shooting jumpers. I’d put King on the block, make teams deal with his range of moves, and let everyone feed off that. The weave isn’t working. 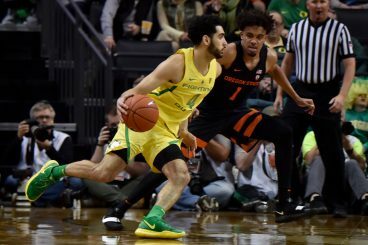 A few bad losses, a couple of heartbreakers and a couple of normal losses have Oregon outside the NCAA tourney unless they win the conference tourney. They are who they are. Inconsistent, without offensive leadership. Mr. King? Have no fear, Duck fans, recruiting is going well and help is coming. C.J. 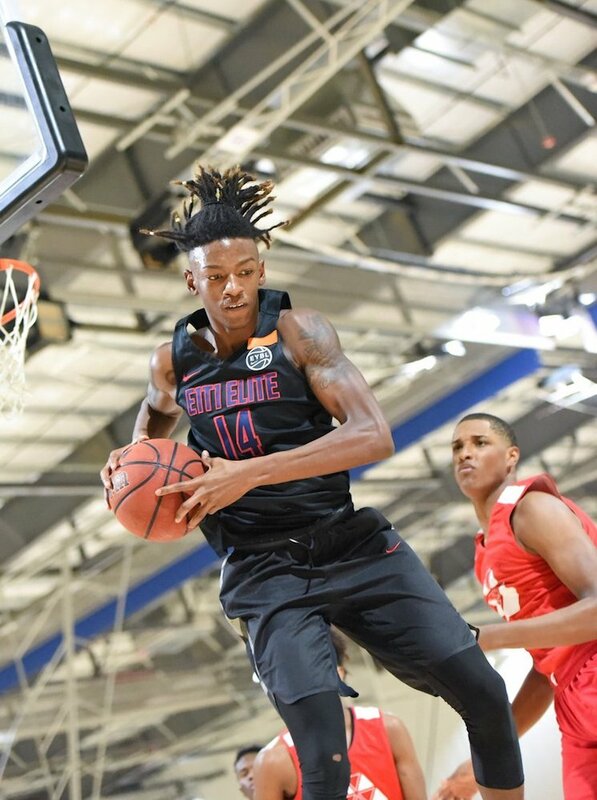 Walker is a legit five-star who would have been a McDonald’s All-American were it not for ratings being established so early. He’s easily one of the best forwards in the nation, and the boards were full of discussion about his slight from that group. CJ Walker is a scorer, rebounder, defender and as hard a worker you’ll find. Walker’s a great player in addition to being tremendous athlete. Not an elite athlete working on his game. He’s a great player who is an athlete. He’ll bring a legit game from all three levels: back to the basket, mid-range and the deep ball. And here’s some of his athleticism. Best of all, nobody is going to outwork him. You’re gonna love Walker. If … King returns for next year, it’ll be because the draft is so deep this year and he’s just coming off an injury. If he does, oh boy. I know they were terrible in Boulder, but all is not lost. King is a legit talent. Wooten will be playing 30 minutes a game again next year, and two guys Oregon tried to rely on this year haven’t played well for long stretches (White and Amin). They’ll be replaced by Walker and the player who some consider the number-one JC prospect, Chris Duarte. And Oregon still has two or three scholarships to offer. All is not lost. They will be ready for prime time again very soon.